Order licensed version Fomsoft Recovery NTFS software. 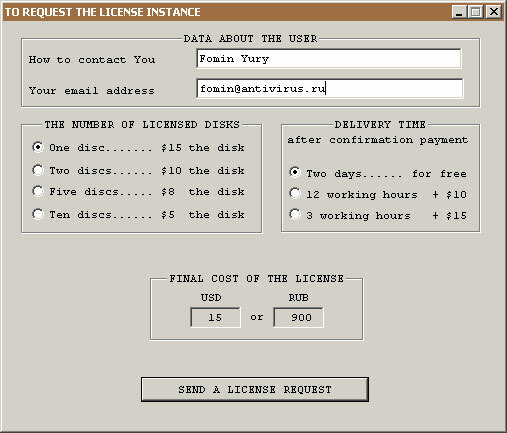 To order a licensed version of the need to activate the option from the main menu window [ Order licensed version of ], at the same time on the screen will be displayed dialog box shown in Figure 24. Fig. 24. Dialog request licensed version. Fig. 25. Notification of Fomsoft server on receipt of an order. In addition, the e-mail address specified in the order will be sent a letter of control, fig.26. Fig. 26. Control of the receipt of an order. In reply to this letter should confirm the need for execution of the order. If no response , Order fulfillment will remain without. 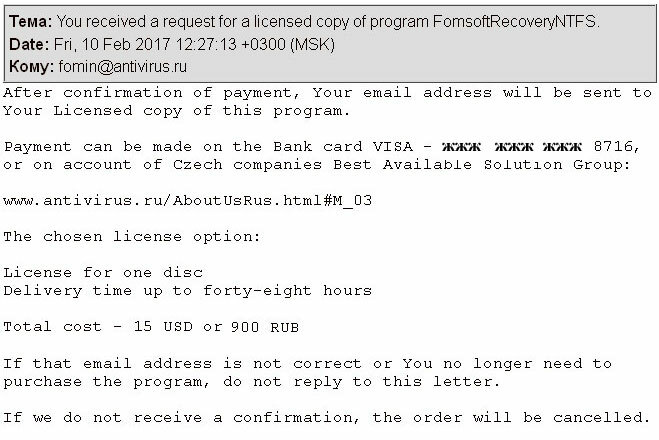 After receipt of payment, and in accordance with the specified order Delivery , the user will receive a specified e-mail address of a licensed copy of the software Fomsoft Recovery NTFS , as well as Login and Password Fomsoft for authorization on the server.